For our post conference dinner we’ll be headed to a winery currently celebrating its 30th year anniversary. What makes our visit so appropriate is that the winery is also in the process of opening one of Oregon’s newest visitor experiences. Willamette Valley Vineyards, founded by Jim Bernau in 1983, clearly is on a path to crafting a visitor experience that pairs with their award winning wines. 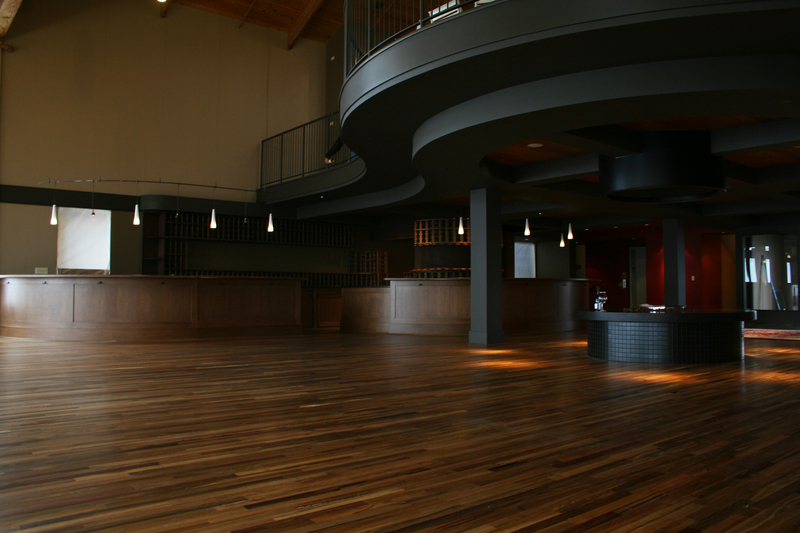 The new space – overlooking the estate vineyard and newly constructed barrel storage facility – is large, with warm and dark tones that may remind one of being deep within a barrel room. The design is such that it lends itself to create multiple smaller, more intimate spaces within the overall large room. This lends to flexibility of use; there is a tasting bar, a pairing bar, a mezzanine level, and a private club room. As the new space comes into full operation (not expected until early 2014) visitors to the winery will get to enjoy a wine tasting, a wine and food pairing, tutored tastings, and can reserve a private space for their own entertaining needs. For bigger events, the space can be converted into a larger, single-use space while still retaining the feeling of intimacy and warmth. Behind the scenes, the space is carefully designed to accommodate wine storage needs, is efficient to staff, and is easy to work – all important considerations when designing a tasting room! Whether your tasting room is the top of a barrel from the back door of the winery or if you offer a multi-use space and a number of programs for your winery guests, a winery experience can be many things to many people. It is up to you, the winery, to craft that experience for your guests. Wine and visitor experience – the ultimate pairing. The post conference dinner to Willamette Valley Vineyards is sold out. Stunning new tasting room, wines and food! What an excellent evening we all had together!